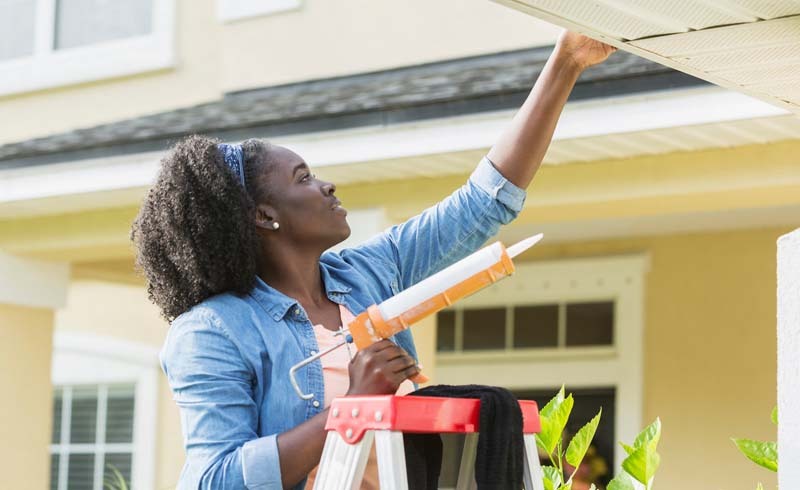 Tackling these projects around your home now can help avert disaster later in the year—and even save you some money on your energy bills. Home improvement projects may not be the first things on your to-do list this fall, but you may want to add a few items to that list (maybe after “book holiday travel” but before “buy new soccer cleats for the kids”) to help prepare your home for the chillier months approaching. If you’re relatively handy, you can handle many these check-ups yourself; if not, have a trusted home repair pro (ask neighbors for their recommendations) come out and take a look. The process should be quick and easy, and if any repairs are needed, you can start coordinating those ASAP. The summer’s sun exposure—plus general wear and tear since the last time you had your roof checked—can cause roof and siding materials to warp, chip, and more. Look for any cracks or other damage; it will be much easier to fix these issues now than in the midst of winter if it starts to leak or is otherwise damaged. If you plan to use the fireplace this fall and winter, make sure the chimney is clean and in good shape. (And make sure no squirrels or other critters have taken up residence inside!) A blockage in the chimney can cause a fire or other hazards and be an inconvenient mess. Get ahead of any smoke- or ash-related issues by giving the whole set-up a good cleaning. Yes, fall will drop a ton of freshly fallen leaves into your gutters no matter what you do, but getting ahead of that can prevent water damage and other high-cost repairs. Take some time (or, better yet, have a handyman come by) to check your home’s gutters for dead leaves and other potential blockages. If there are any, have them cleared them out so water can properly drain. Doors and windows should be sealed against the elements with weather stripping and/or caulking. These protective materials keep nasty weather out and the heat in—cracked, chipping, or otherwise damaged seals can cause much higher energy bills as you lose heat to the outdoors. Also check that doors and windows are properly attached to their frames, with no gaps or cracks. Summer’s heat and moisture (thanks, humidity) can cause signs of wear and tear in floors, especially if you have real hardwood flooring. Scratched, dull, or damaged floors can be sanded down and refinished; more substantial damage, such as loose floorboards or deep scratches, may call for replacement boards.